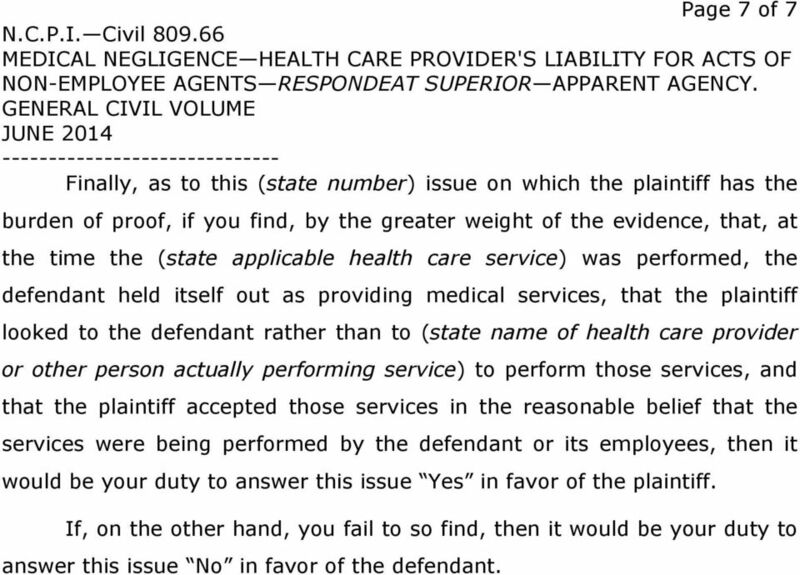 Download "Was (state name of health care provider or other person actually performing service) 2"
1 Page 1 of MEDICAL NEGLIGENCE - HEALTH CARE PROVIDER'S LIABILITY FOR ACTS OF NON-EMPLOYEE AGENTS - RESPONDEAT SUPERIOR - APPARENT AGENCY. 1 NOTE WELL: This instruction previously was labeled N.C.P.I. Civil A Medical Negligence- Health Care Provider's Liability For Acts of Non-Employee Agents - Respondeat Superior - Apparent Agency. 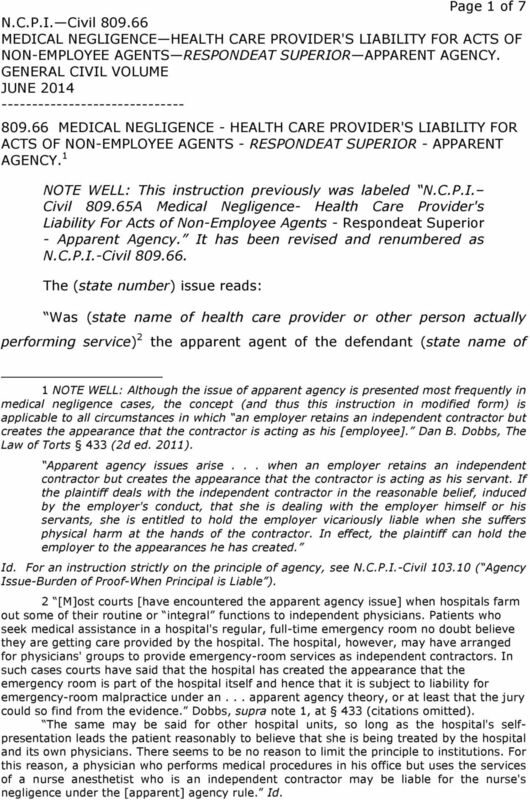 It has been revised and renumbered as N.C.P.I.-Civil The (state number) issue reads: Was (state name of health care provider or other person actually performing service) 2 the apparent agent of the defendant (state name of 1 NOTE WELL: Although the issue of apparent agency is presented most frequently in medical negligence cases, the concept (and thus this instruction in modified form) is applicable to all circumstances in which an employer retains an independent contractor but creates the appearance that the contractor is acting as his [employee]. Dan B. Dobbs, The Law of Torts 433 (2d ed. 2011). Apparent agency issues arise... when an employer retains an independent contractor but creates the appearance that the contractor is acting as his servant. If the plaintiff deals with the independent contractor in the reasonable belief, induced by the employer's conduct, that she is dealing with the employer himself or his servants, she is entitled to hold the employer vicariously liable when she suffers physical harm at the hands of the contractor. In effect, the plaintiff can hold the employer to the appearances he has created. Id. For an instruction strictly on the principle of agency, see N.C.P.I.-Civil ( Agency Issue-Burden of Proof-When Principal is Liable ). 2 [M]ost courts [have encountered the apparent agency issue] when hospitals farm out some of their routine or integral functions to independent physicians. Patients who seek medical assistance in a hospital's regular, full-time emergency room no doubt believe they are getting care provided by the hospital. The hospital, however, may have arranged for physicians' groups to provide emergency-room services as independent contractors. In such cases courts have said that the hospital has created the appearance that the emergency room is part of the hospital itself and hence that it is subject to liability for emergency-room malpractice under an... apparent agency theory, or at least that the jury could so find from the evidence. Dobbs, supra note 1, at 433 (citations omitted). The same may be said for other hospital units, so long as the hospital's selfpresentation leads the patient reasonably to believe that she is being treated by the hospital and its own physicians. There seems to be no reason to limit the principle to institutions. For this reason, a physician who performs medical procedures in his office but uses the services of a nurse anesthetist who is an independent contractor may be liable for the nurse's negligence under the [apparent] agency rule. Id. 4 Page 4 of 7 First, that the defendant has held itself out as providing medical services, such as (state applicable medical services, e.g., anesthesiology, radiology, etc. ), as opposed simply to providing facilities for the performance of medical services. 9 The holding out of itself by the defendant as providing medical services, such as (state applicable medical services, e.g., anesthesiology, radiology, etc. ), may be by express verbal representations or by conduct, or it may be general and implied 10 from the circumstances. 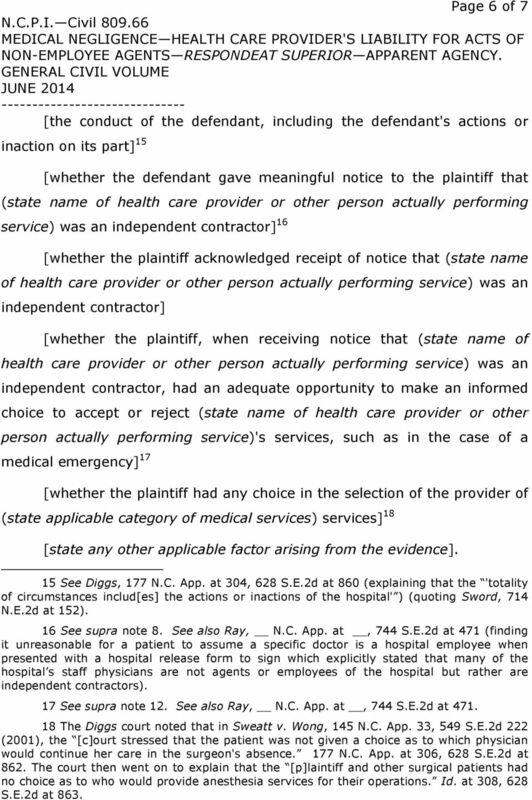 Second, that the plaintiff looked to the defendant and not to (state name of health care provider or other person actually performing service) to perform those services. 11 out as providing medical services, (2) the plaintiff looked to the hospital rather than the individual medical provider to perform those services, and (3) the patient accepted those services in the reasonable belief that the services were being rendered by the hospital or its employees. A hospital may avoid liability by providing meaningful notice to a patient that care is being provided by an independent contractor. ). 9 See id. at 307, 628 S.E.2d at 862 (noting that in Hoffman v. Moore Reg'l Hosp., 114 N.C. App. 248, 441 S.E.2d 567 (1994), [t]here was no indication... that the hospital was holding itself out as providing the services involved as opposed to simply providing facilities for the performance of the procedure by private practitioners ). 10 See id. at 303, 628 S.E.2d at 860 ( Courts considering this factor often ask whether the hospital held itself out to the public as a provider of hospital care, for example, by mounting extensive advertising campaigns. In this regard, the hospital need not make express representations to the patient that the treating physician is an employee of the hospital; rather a representation also may be general and implied. ) (citation omitted). See also Brown v. Moore, 247 F.2d 711, (3d Cir. 1957) (finding that numerous factors indicated a holding out, including the peculiarly pertinent one that the hospital collected the bills as well as submitted a bill to the patient; in addition, the release signed by the patient authorized the hospital to administer necessary treatment and an indemnification agreement referred to the plaintiff as a patient of the hospital); Osborne v. Adams, 550 S.E.2d 319, 322 (S.C. 2001) (noting that the hospital's marketing efforts touted its first rate neonatal facilities and staff and referenced neonatologists as an integral part of [the hospital's Neonatal Intensive Care Unit] team ); Gilbert v. Sycamore Mun. Hosp., 622 N.E.2d 788, 796 (Ill. 1993) (observing that the treatment consent form expressly stated that the patient would be treated by physicians and employees of the hospital ). 11 See Estate of Ray v. Forgy, N.C. App.,, 744 S.E.2d 468, 471 (2013) (finding decedent looked to her physician separately and distinctly from the hospital where she wrote her physician s name and checked a box labeled Physician separately from checking a box labeled Hospital Personnel ). 5 Page 5 of 7 And Third, that the plaintiff accepted those services in the reasonable belief that the services were being rendered by the defendant or its employees. [A health care provider such as the defendant may avoid liability by providing meaningful notice to a patient that care is being provided by an independent contractor. 12 ] In determining whether the plaintiff reasonably believed that the (state applicable category of medical services) services were being rendered by the defendant, you must consider whether, under the totality of factors 13 present in this particular case, a reasonable person in the same or similar circumstances as the plaintiff would have believed that the (state applicable category of medical services) services were being rendered by the defendant. 14 As applied to this case, the factors may include: 12 Diggs, 177 N.C. App. at 307, 628 S.E.2d at 862 (citing Cantrell v. N.E. Ga. Med. Ctr., 508 S.E.2d 716, (Ga. Ct. App. 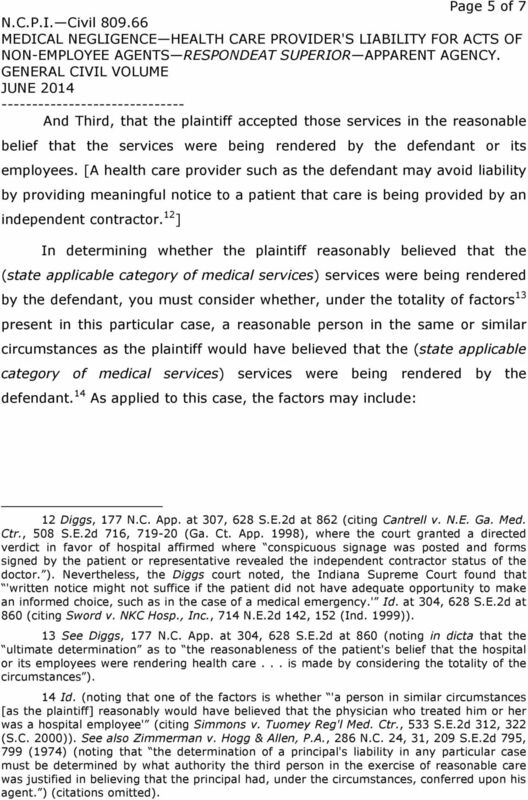 1998), where the court granted a directed verdict in favor of hospital affirmed where conspicuous signage was posted and forms signed by the patient or representative revealed the independent contractor status of the doctor. ). Nevertheless, the Diggs court noted, the Indiana Supreme Court found that 'written notice might not suffice if the patient did not have adequate opportunity to make an informed choice, such as in the case of a medical emergency.' Id. at 304, 628 S.E.2d at 860 (citing Sword v. NKC Hosp., Inc., 714 N.E.2d 142, 152 (Ind. 1999)). 13 See Diggs, 177 N.C. App. at 304, 628 S.E.2d at 860 (noting in dicta that the ultimate determination as to the reasonableness of the patient's belief that the hospital or its employees were rendering health care... is made by considering the totality of the circumstances ). 14 Id. 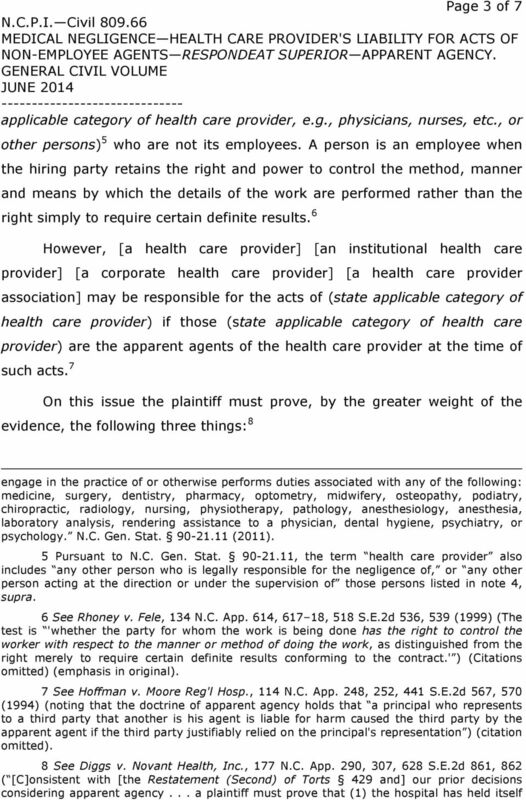 (noting that one of the factors is whether 'a person in similar circumstances [as the plaintiff] reasonably would have believed that the physician who treated him or her was a hospital employee' (citing Simmons v. Tuomey Reg'l Med. Ctr., 533 S.E.2d 312, 322 (S.C. 2000)). See also Zimmerman v. Hogg & Allen, P.A., 286 N.C. 24, 31, 209 S.E.2d 795, 799 (1974) (noting that the determination of a principal's liability in any particular case must be determined by what authority the third person in the exercise of reasonable care was justified in believing that the principal had, under the circumstances, conferred upon his agent. ) (citations omitted). 6 Page 6 of 7 [the conduct of the defendant, including the defendant's actions or inaction on its part] 15 [whether the defendant gave meaningful notice to the plaintiff that (state name of health care provider or other person actually performing service) was an independent contractor] 16 [whether the plaintiff acknowledged receipt of notice that (state name of health care provider or other person actually performing service) was an independent contractor] [whether the plaintiff, when receiving notice that (state name of health care provider or other person actually performing service) was an independent contractor, had an adequate opportunity to make an informed choice to accept or reject (state name of health care provider or other person actually performing service)'s services, such as in the case of a medical emergency] 17 [whether the plaintiff had any choice in the selection of the provider of (state applicable category of medical services) services] 18 [state any other applicable factor arising from the evidence]. 15 See Diggs, 177 N.C. App. at 304, 628 S.E.2d at 860 (explaining that the 'totality of circumstances includ[es] the actions or inactions of the hospital' ) (quoting Sword, 714 N.E.2d at 152). 16 See supra note 8. See also Ray, N.C. App. at, 744 S.E.2d at 471 (finding it unreasonable for a patient to assume a specific doctor is a hospital employee when presented with a hospital release form to sign which explicitly stated that many of the hospital s staff physicians are not agents or employees of the hospital but rather are independent contractors). 17 See supra note 12. See also Ray, N.C. App. at, 744 S.E.2d at The Diggs court noted that in Sweatt v. Wong, 145 N.C. App. 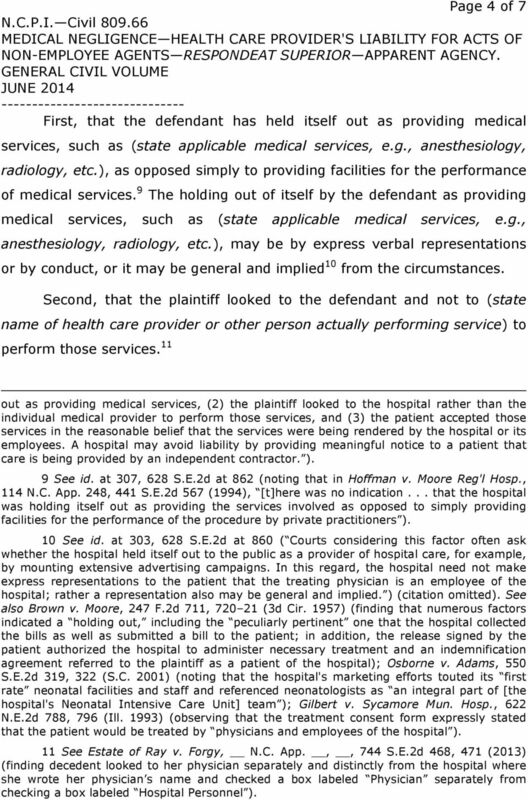 33, 549 S.E.2d 222 (2001), the [c]ourt stressed that the patient was not given a choice as to which physician would continue her care in the surgeon's absence. 177 N.C. App. at 306, 628 S.E.2d at 862. The court then went on to explain that the [p]laintiff and other surgical patients had no choice as to who would provide anesthesia services for their operations. Id. at 308, 628 S.E.2d at 863. 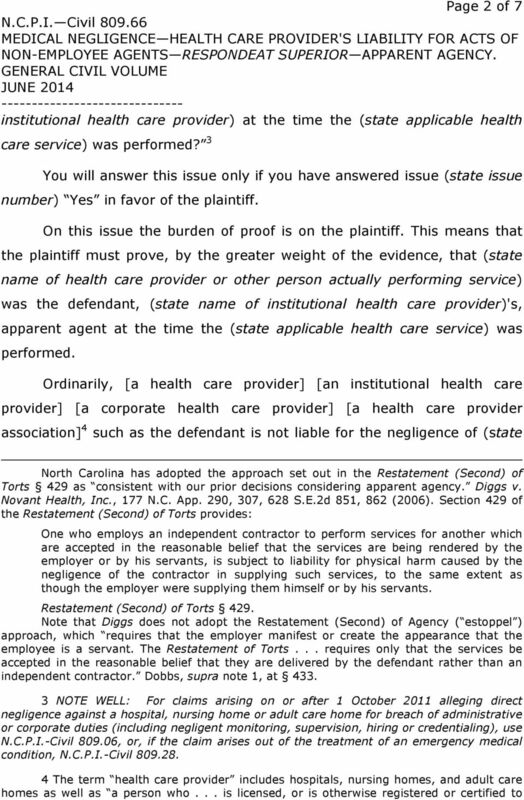 7 Page 7 of 7 Finally, as to this (state number) issue on which the plaintiff has the burden of proof, if you find, by the greater weight of the evidence, that, at the time the (state applicable health care service) was performed, the defendant held itself out as providing medical services, that the plaintiff looked to the defendant rather than to (state name of health care provider or other person actually performing service) to perform those services, and that the plaintiff accepted those services in the reasonable belief that the services were being performed by the defendant or its employees, then it would be your duty to answer this issue Yes in favor of the plaintiff. If, on the other hand, you fail to so find, then it would be your duty to answer this issue No in favor of the defendant. Illinois Association of Defense Trial Counsel Springfield, IL http://www/iadtc.org 800-232-0169 IDC Quarterly Vol. 17, No. 2 (17.2. Health Law By: Roger R. Clayton* Heyl, Royster, Voelker & Allen Peoria Advertising, Consent Forms, and Apparent Agency: A Review of the Illinois Supreme Court s Ruling in York v. Rush- Presbyterian-St.
Illinois Association of Defense Trial Counsel P.O. Box 7288, Springfield, IL 62791 IDC Quarterly Vol. 14, No. 3 (14.3. Health Law By: Roger R. Clayton* Heyl, Royster, Voelker & Allen Peoria What Every Litigator Needs to Know About the Medical Studies Act Background The Medical Studies Act (Act), 735 ILCS 5/8-2101 et seq. FEBRUARY 1997 LAW REVIEW MOLESTATION LIABILITY EXAMINES SCOPE OF EMPLOYMENT & FORESEEABILITY. James C. Kozlowski, J.D., Ph.D. 1997 James C.
BAD FAITH INSTRUCTIONS Introduction These instructions are not materially changed from RAJI (CIVIL) 4th. The duty of good faith and fair dealing is implied in every contract. Rawlings v. Apodaca, 151 Ariz. Title: Current Construction Injury Law in California Issue: Oct Year: 2003 Current Construction Injury Law in California Morgan C.